Have gotten many compliments on this particular sweatshirt. People really enjoy it....so do I!!!! Wish I would have gotten a bigger size! So pretty! But size runs small! I sure wish it had been the right size!!!! The quality of the top looked very good, however, I had to return it to you as I had ordered a size Med. and I could tell before I even opened the bag that even the neck looked very small, and it must have been mismarked as it was way too small for me. I would love to have had an exchange, but not sure if I could have gotten it for the same price? If so, please let me know. So pretty. Enjoy wearing this . plan to wear it during the holiday season. replaces one I have had for years and is starting to wear out. This is a very pretty sweatshirt. I ordered a large hoping for more roominess(I usually wear a small). It was a good thing I did because the large is not to big at all. This is beautiful sweatshirt, but I found it ran small. I usually wear an XL because I want a roomy sweatshirt, however the XL was NOT roomy enough so I had to go up a size. Knowing this, I ordered a L for my friend who usually wears a Medium. It was a perfect fit for her. I wash this garment in cold water, but hang dry because I'm afraid of shrinkage. This was a beautiful sweat shirt. I really liked the sparkling design. A great Christmas top. It was marked the right size that I wear. It fit me just fine on top. The shoulder's, sleeves. But the bottom band was way to small. To tight to even fit below my waist. Very uncomfortable. Most certainly this was irregularly made. I had to return it. It's beautiful. No other words are necessary. Looks very nice for work. Still have to get it then my opinion will count. Because the price was reduced and I have like it for some time. It looked pretty and the price was right (on sale). I wanted something nice and not too flashy for Christmas. It was so pretty, but the bottom band was sized smaller than the rest of the sweatshirt! It kept riding up, so I gave it away. It's what my wife told me to buy! I love sparkly things and this looked very pretty! I need a holiday sweatshirt and prefer navy to bright reds and greens. As a present for my wife. Now insyead of Christman so she can wear it for the holidays. I wanted a Christmas that was not to fancy. This one looks great. I love Christmas sweatshirts because I can dress them up or down with turtlenecks. I had previously purchased a similarly patterned sweatshirt years ago and it had warn out. This was a nice replacement. Liked the look. Also replacing one that I have had for many years that is starting to look old. Loved the design and price. I liked the pretty sparkling tree on the sweatshirt. Pretty and the season was a plus. 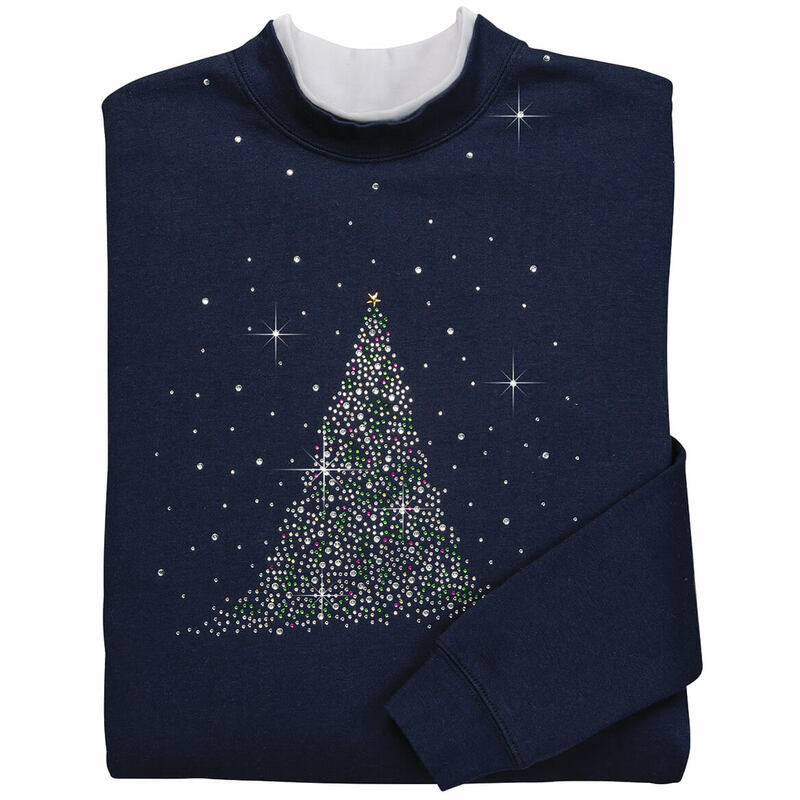 Beautiful holiday sweatshirt that is beautifully embellished with shiny stones. It runs true to size and washes and dries very nicely in your drier. Have always admired this sweatshirt and looking forward to having my own. Be great to wear Christmas morning! What is the bust size for XL sparkling tree sweatshirt ? If you don't know, then I will not be ordering it!!! BEST ANSWER: Thank you for your question. 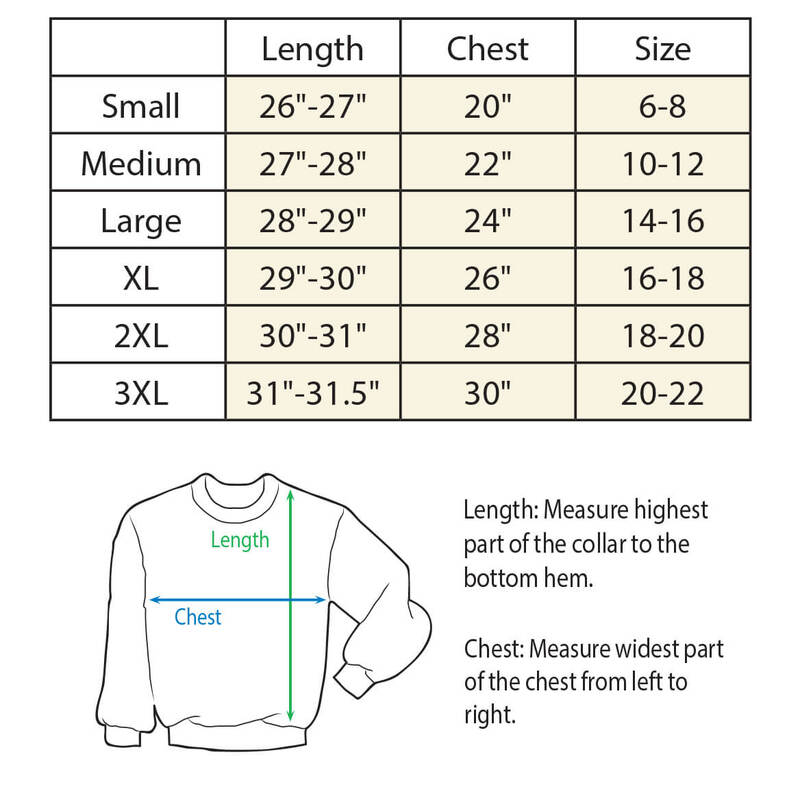 The chest measurement is 26" and is a size 16-18. We hope this information will be of help to you. 26 inches is pretty darn small for an xl...what is the length of these sweatshirts? in 2xl? Just below the waist, it runs small and narrow fit. How do the sizes run? Is a medium like a size 8 - 10 and a large like a size 12 -14? BEST ANSWER: Enter an answer to this question.This is beautiful sweatshirt, but I found it ran small. I usually wear an XL because I want a roomy sweatshirt, however the XL was NOT roomy enough so I had to go up a size. Knowing this, I ordered a L for my friend who usually wears a Medium. It was a perfect fit for her. I wash this garment in cold water, but hang dry because I'm afraid of shrinkage. Thank you for your question. Size medium is 10-12 and Large is 14-16. We hope this information will be of help to you. BEST ANSWER: Thank you for your question. The Medium fits 10-12, Large 14-16, XL 16-18. We hope this information will be of help to you.